Browsing the website for Bateman Skincare, I notice the clean lines and modern influence on the company’s homepage, featuring a man, a woman, an axe, and a knife, possibly from Best Made Company. Diving further in, their products include a rose hip + seaweed facial cleanser, an herbal balancing toner, a zinc + clay mask, daily hyaluronic cream, and a daily hyaluronic serum. I believe in taking care of myself, and these products (along with a balanced diet and a rigorous exercise routine) appear to be a perfect addition to my morning routine—if a little too affordable for my tastes. According to John Squires at Bloody Disgusting, “it’s as easy as spending a few bucks and following some simple directions.” The products are available separately or together in a smart and restrained regimen attaché, which is currently sold out. They even offer lapel pins in the shape of an axe and a chainsaw that would look tasteful on anything from Armani to Brunello Cucinelli. I would kill for that attaché. The products can be used on dry, oily, combination, or problematic skin—something I know nothing about. The clever skincare line uses only the best ingredients ranging from bentonite clay, witch hazel, seaweed, and of course water, the source of all life. There is no alcohol, because alcohol dries your face out and makes you look older. All their skincare products are of course cruelty-free, which is a nice change of pace in this nasty world that we live in. 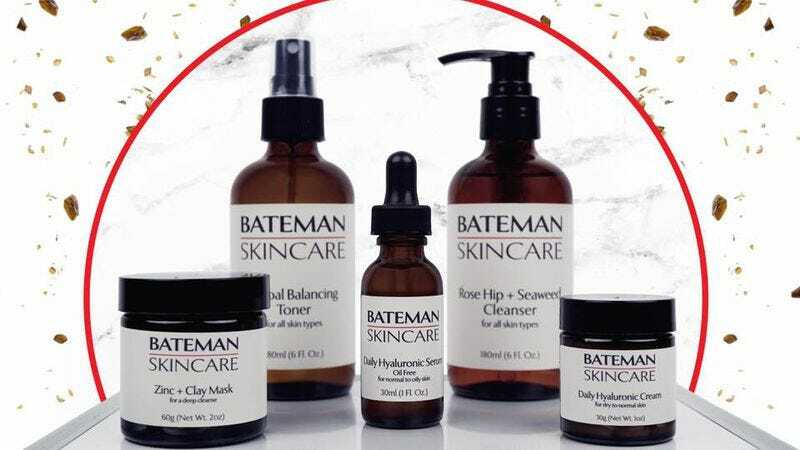 According to Bateman Skincare’s sharply designed website, “Bateman Skincare unisex products cannot solve the world’s problems but they will help you with your inner self and create a safe place for you to tackle the day appropriately.” It will also—hopefully—not get you mistaken for Marcus Halberstam. Now if you’ll excuse me, I have to return some videotapes.